Your resume is an advertisement where you are the product being sold. You only get one chance to make a first impression. Help market yourself the right way through stronger writing and personalized branding. Do you struggle to stand out in a sea of qualified candidates? TheWritingRemedy helps you to strategically craft resumes, cover letters, and personal statements that highlight your achievements and get you noticed. Branding isn't just for businesses. Let us work together to create a resume that reflects the value you bring to your employers and why you're the ideal choice for the job. Finding a job in 2018 is not the same as it was a generation ago. Last year, there were an average of 250 applicants for each corporate job opening. With the rise in automation and an increasingly global workforce, it sometimes feels like getting hired in today's economy is an impossible endeavor. Yet someone still needs to fill those empty spots. Why not you? Enlisting an experienced writer to help edit your resume gives you an advantage over the competition. You wouldn't want to let a generic introduction, or even a simple typo, cost you the opportunity to be noticed. When it comes to getting a job, applicants usually only have one chance. Don't squander yours. Resumes that stand out and get you noticed use targeted language and clearly written accomplishments to sell you as the best candidate for the job. Through personalized questionnaires that reach to the heart of your experience and goals, we will work together to create a strategically tailored resume for the positions and industries that best fit your interests. The kind of resume that sets you apart from the hundreds of other job-seekers vying for the same openings. Do you feel like your current resume is lacking something, but you're not sure what? Enter your name for a free, no-obligation resume consultation with Thewritingremedy. This could be that first step toward geting you to the next level in your job search, so you can finally reach your Professional goals. MY NAME IS HILLARY WEEKS, AND MY MISSION IS TO HELP YOU ACHIEVE YOUR GOALS THROUGH BETTER WRITING. Writing can be a chore. Yes, we have to do it at work or school, but that doesn't mean we're any good at it. There's a reason writing is considered an art form, and crafting a thoughtful, professional job history is no exception. In my former life working in nonprofits, I was witness to some pretty terrible cover letters and resumes. So many were lacking in personality, with no concrete information about previous experience, or even keywords about the job. It's no wonder they went straight into the trash. Your resume is an advertisement, where you are the product being sold. If you can't stand out enough to make it past the HR algorithms, how can you expect to get into the hands of the decision makers? Fortunately, there is a way to clearly communicate your talent and experience. And it's a lot simpler than you might expect. While I can't guarantee you'll get the job, I can make sure you are better prepared than the competition. I know from first hand experience how hard it is to enter the job market for the first time and to change careers, especially without outside support. Let me use my editing, writing, and marketing skills to finally get you out of the trash and onto the top of the pile. Ready to Get started? 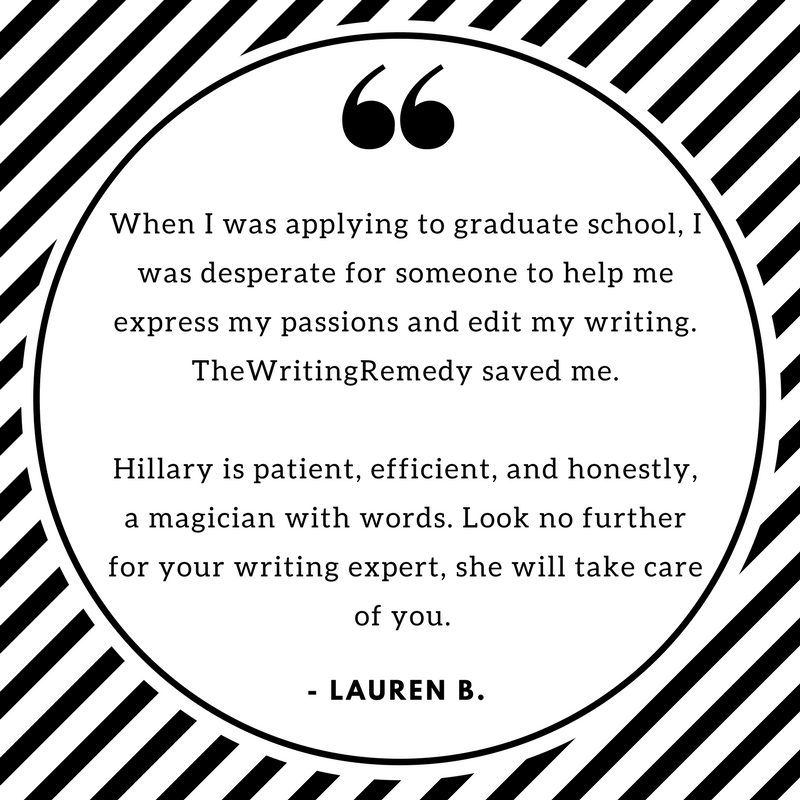 Email me at hillary@thewritingremedy.com for a free consultation now. The only thing you have to lose is your old, outdated resume!